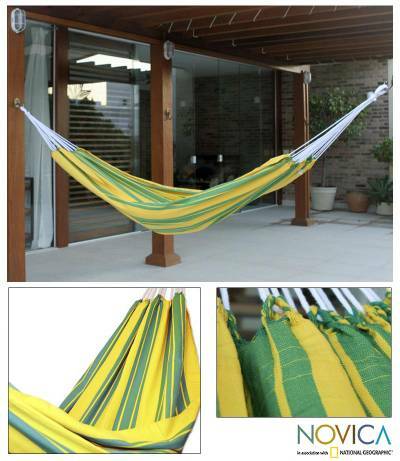 Cotton hammock (Single), "Brazilian Pride"
Inspired by Brazil's national colors, this bright yellow and green hammock is designed for relaxing excellence. From Brazil's Hammock Artisans of Ceará, the cotton hammock is finished by hand with braided details leading to the hanging loops. You can find cotton hammock 'Brazilian Pride' (single) by Hammock Artisans of Ceará in hammock categories such as Nature Hammock, Cotton Hammock and Fabric Hammock. Enjoy exploring these sections for other Novica treasures.